The MLB Draft is just one day away. This draft doesn’t garner nearly enough attention as does the drafts of both the NFL and NBA. It does, however, give teams a chance to peg their future on a stud coming out of college or high school. The Rockies have nailed many picks in their organization’s history. With Colorado selecting No. 8, there should be a surplus of talent to choose from. This has me thinking, though. Who have been three of the best picks to ever play at Coors Field? Let’s take a gander at who I believe are the three best to ever be picked up by the Rockies in the draft (present team excluded). Say all you want about his career 4.60 ERA, this guy could win games. The 1997 second-round pick of the Rockies notched 72 wins in his 10 seasons in Colorado. He did this all without averaging more than four strikeouts per nine innings. How is this possible? Cook had a sinker that was regarded as one of the best in the game during that stretch. He began his career with just a fastball and some off-speed selections, but added a dimension to that fastball by getting it to sink – and sink a lot. Cook induced 2,648 ground balls that led to outs with the Rockies. Keeping the ball down is important for a pitcher, especially at Coors Field. Cook had a ground ball to fly ball ratio of 2.45 throughout his career. This shows that he kept the ball in the park, even if he wasn’t striking a lot of guys out. Though Cook went on to become an All-Star and pitch in the World Series, what may have been his greatest feat was pitching two complete games on fewer than 80 pitches. In 2008, Cook hurled a complete-game shutout on just 79 pitches against the Padres (Side note: see where Troy Tulowitzki was batting?!). One year earlier, the right hander from Hamilton, Ohio threw a complete game against the Padres on only 74 pitches. Those two performances were the lowest pitch count total of a complete game since 1990. A year after Cook was selected, the Rockies took a kid out of Stillwater, Okla. in the seventh round named Matt Holliday. Little did they know, Holliday would become an All-Star and Silver Slugger three times. 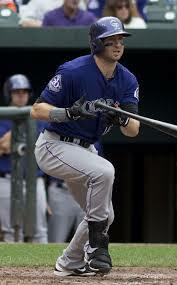 The 2007 runner-up in NL MVP voting smacked 128 home runs and 483 RBI during his tenure with the Rockies. 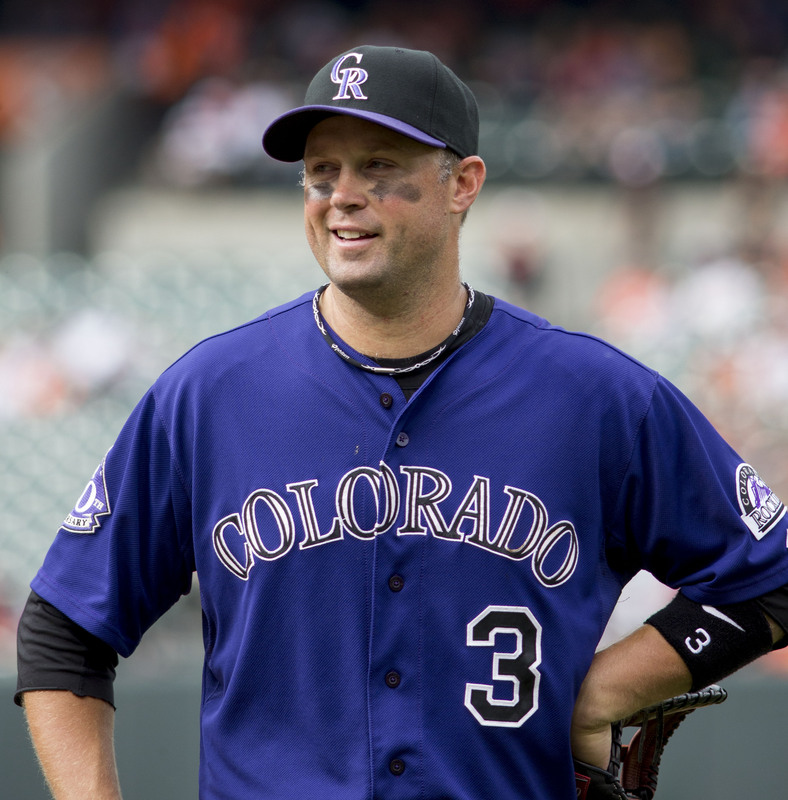 Holliday enjoyed one of the best seasons in Rockies history in 2007. The outfielder led the league in hits (216), doubles (50), RBI (137) and batting average (.340). His 2007 season was best exemplified by this game-winning slide against the Padres to get to the playoffs. Holliday finished second in MVP voting, despite have better numbers than the eventual winner, Jimmy Rollins. 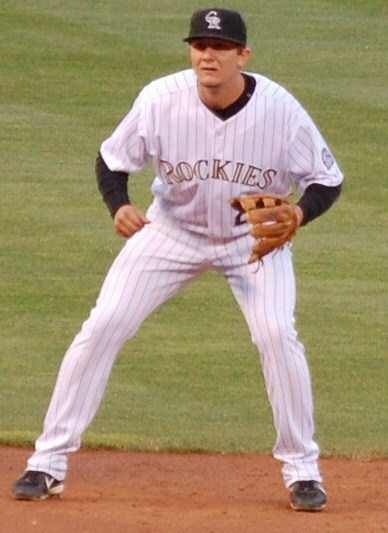 Holliday was traded after the 2008 season to the Oakland Athletics for Carlos Gonzalez, Houston Street and Greg Smith. He now mans the left-field corner for the St. Louis Cardinals. Helton, the No. 8 overall selection in the 1995 draft, went on to have a pretty decent career, I guess. 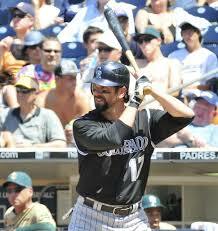 Helton finished his 17-year career as one of the greatest hitters to ever put on a Rockies uniform. He ranks first in Rockies history in hits (2,519), doubles (592), home runs (369) and RBI (1,406). The “Toddfather” also was no stranger to acceptance speeches as he accumulated five All-Star appearances, four Silver Sluggers and three Gold Gloves. Helton will be the first player to have his No. 17 retired on Aug. 17 to celebrate his illustrious 17-year career. Added on to his success on the field, Helton has been named “Tennessean of the Year” and been inducted into the Colorado Sports Hall of Fame. He still awaits the grandest of awards, though – Cooperstown. If it were up to only Rockies fans, he would have a bust and a section dedicated to just himself. With the eighth selection in the 2014 MLB Draft, might we see somebody of this caliber join the organization? One can only hope. It’s hard to be giddy after a 4-2 loss to the Diamondbacks, but with Eddie Butler being called up, Rockies fan have something to celebrate. Troy Tulowitzki leads all of the majors in All-Star votes. Purple Row describes the current losing streak as a free fall. Will Carlos Gonzalez return to the DL? Eddie Butler can save the season for the Rockies. Rockies Zingers states that Tyler Matzek is flying under the radar. Should the Rockies trade Carlos Gonzalez? It’s not Walt Weiss’ fault – the players need to own up. Fox Sports says it is time to break up the band in order to get back to winning. In order for one to be prolific, they must excel at something in an extraordinary way. Troy Tulowitzki has been prolific in many ways since donning a Rockies uniform. What separates Tulowitzki from his peers? Defense, defense, defense. The shortstop from Long Beach State has been a part of 1,513 putouts and 626 double plays in his nine-year career. “Tulo” owns a career fielding percentage of .986.With such a demand at the position, I challenge you to find better numbers from anybody else in that nine-year window. With his 6-foot-3 frame, Tulo may have the most range among all shortstops in the majors. Let me rephrase that: Tulo DOES have the most range among all shortstops in the majors. Inside Edge Fielding rates balls in play in categories of remote (1-10 percent), unlikely (10-40 percent), even (40-60 percent), likely (60-90 percent) and routine (90-100 percent). 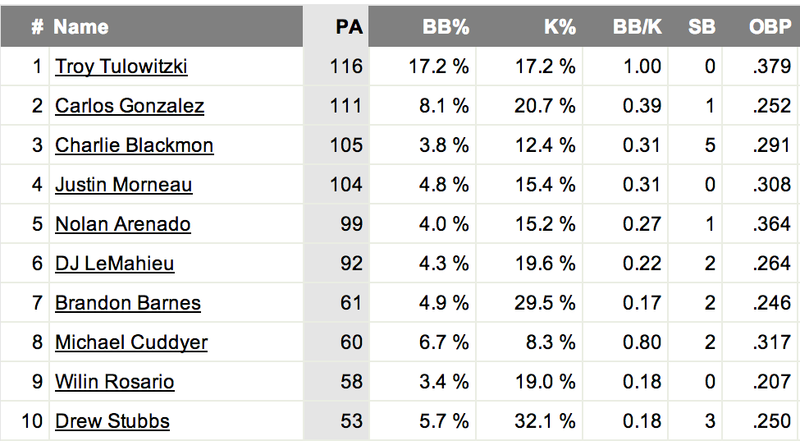 In all remote balls, Tulo makes a play on 12.8 percent of the them. That means, even if there is a minute chance, Tulo has a shot on getting to it and recording an out. By the way, that 12.8 percent is the best in the majors. Are these numbers not making any sense? Take a look for yourself. Two more strides and Tulo could’ve been at third base. Tulowitzki uses that range and strong arm to make big plays at crucial junctures of the game. The two-time Gold Glove winner has saved 90 runs since coming into the league in 2006. That mark stands alone as the most amount of runs saved during that time frame. Tulo has committed less than 10 errors in seven of his nine seasons with the Rockies. That is astounding considering shortstops receive the majority of balls put in play. Sure, Jeter may have pattented the jump-throw, but Tulo has had that play among 20 others in his arsenal. With hops like that, Tulo should be catching alley-oops from Chris Paul. With a DWAR (defensive wins above replacement) of 1.6, Tulo leads the majors (seeing the trend?) in 2014. He is one of only four shortstops to have a DWAR over 1.0. Tulo also leads the league with a Range Factor of 4.84. Range Factor is simply the total number of putouts and assists divided by number of innings played. The next closest on the list is Alexi Ramirez of the Chicago White Sox with a Range Factor of 4.45. Then the logjam ensues with 15 other shortstops coming in with a 4.0 Range Factor or greater. That means he is clearly the best defensive shortstop in the game today. If all these numbers and highlights still don’t have you acknowledging Tulo’s defensive prowess, I’m all ears. The Rockies returned home Monday to begin a 10-game homestand against the Diamondbacks (June 3-5), Dodgers (June 6-8) and Braves (June 9-12). After getting swept by Cleveland, Colorado drug its feet back to Coors Field after going 2-7 on the nine-game roadtrip. June will be a telling month for any postseason hopes. It all starts with the Diamondbacks. 1. Quality outings from the starters. Jorge De La Rosa, Jordan Lyles and Juan Nicasio will toe the rubber against the Diamondbacks. 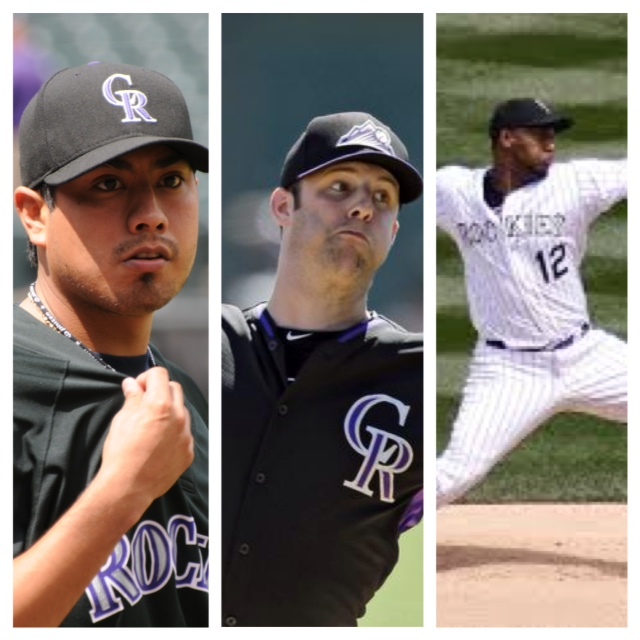 De La Rosa (six), Lyles (seven) and Nicasio (five) are the top three pitchers for the Rockies, in terms of quality starts. De La Rosa has dominated Arizona throughout his career. In 21 starts, the southpaw has held the Diamondbacks to a .233 batting average, .301 on-base percentage and has amassed 86 strikeouts. De La Rosa is on a hot streak, picking up six wins in his last seven starts. Lyles has been a jerk to opposing batters this season. 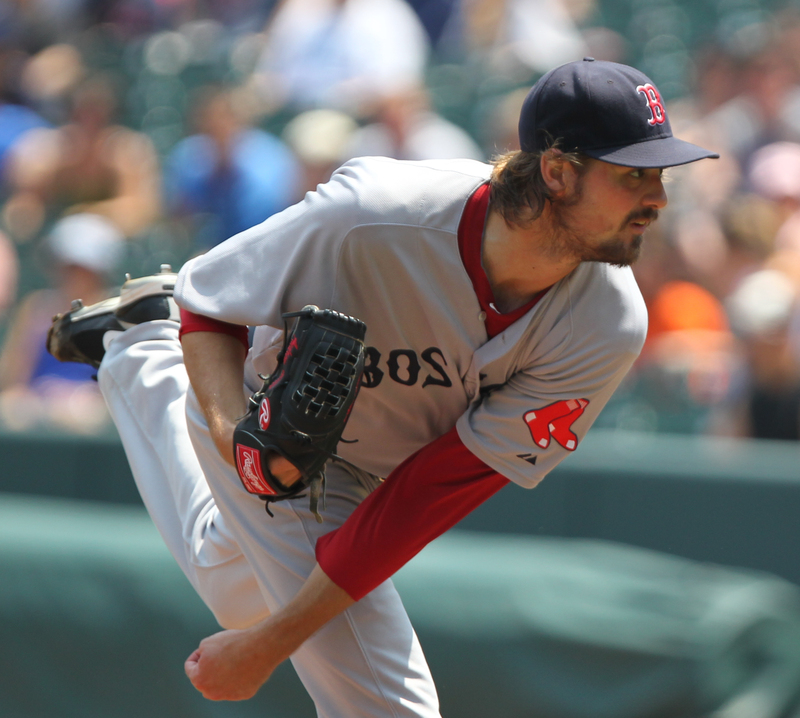 He has relied heavily on the two-seam fastball, throwing it 40 percent of the time. Using a fastball with movement causes the ball to sink as is evident with Lyles inducing 104 ground balls, nine of which were turned for double plays. Arizona has grounded into 40 double plays thus far into 2014, so this should be a dream matchup for Lyles. Nicasio enters the series after a largely successful month of May. The 27-year-old picked up four wins with three coming at Coors Field. What has helped Nicasio is the run support he has gotten from his teammates. The Rockies scored 33 runs in Nicasio’s six starts last month. He leads the majors with an average of 6.36 runs of support per start. Look for a lit-up scoreboard in the final game of the series. 2. Troy Tulowitzki to break out from his recent slump. Since appearing on the cover of Sports Illustrated, Tulowitzki is 1-for-16 with six strikeouts. He couldn’t get back to Coors Field fast enough on Monday. Tulowitzki is hitting .521 with eight home runs and 24 RBI in just 21 homes games this season. Granted, he may be getting help from his buddy, Dinger. Like he has to most teams, Tulowitzki has torched the Diamondbacks this year. In 15 plate appearances, the MVP candidate has collected eight hits including two home runs and six RBI. He has also shown good discipline drawing six walks against the NL West rivals. 3. Three wins for Colorado. I’m not asking for a lot. The horrible road trip is over, so it is time for the Rockies to get back to their winning ways. The Rockies are 14-10 against the other four teams in the NL West, including a 4-2 mark against the Diamondbacks. Arizona is in the midst of a tumultuous season and has seemed to lose interest in challenging for a playoff spot. What better way to add to their misery than by sweeping the Diamondbacks? June is set to be a huge month for the Rockies. May did not go by the script, but the good news is that it is over. Colorado fans, don’t stop believin’ in our guys. Well, this wasn’t how it was supposed to go. The Indians brought their brooms to the ballpark on Sunday and swept the Rockies. Colorado dropped to 2-7 on this road trip. Below are some tweets from the 6-4 loss, including fan reaction, professional analysis and even a web gem nominee from MLB. The Rockies have a travel day on Monday before beginning a series against the Diamondbacks at Coors Field on Tuesday. Game underway here in Cleveland with 80 degrees and lots of sun. With that home run, Dickerson has hit a HR in consecutive games for the 1st time in his career. Not that I believe in jinxes or anything, but since SI cover with Tulo made the stands, he’s 0-for-13 with 5Ks. #Rockies tie it up on a Justin Morneau RBI groundout. 3-3 T3. Morneau’s RBI was his 897th career RBI. 3 RBI away from 900. Would become 21st active player with 900+ RBI. #Rockies Chacin’s FB coming in at 88-89 but without sink it needs for him to be effective. #Rockies tie it up on a sac fly from Blackmon. Barnes with an incredible dive at home. 4-4 T7, runner on 3rd, 2 outs. FYI, #Rockies are 0-for-6 today with RISP. Road trend continues. With this strikeout count piling up, #Rockies should rename it Regressive Field. LeMahieu has some nice pop to the opposite field. Well, if not nice, than definitely underrated. Michael Bourn. MICHAEL. BOURN. I don’t even know if I can be mad about this. Just exemplifies this awful road trip. Well…thank God this road trip is over. That was the 5th walk off home run surrendered by the Rockies. That’s more than in any other season. And it’s June 1. Here’s to hoping the Rockies end their drought on the road and steal one from the Indians on Sunday. As long as this little drummer boy keeps quiet, it will be a good day. Patrick Saunders of the Denver Post looks into a possible nickname for Nolan Arenado. Purple Row discuss Franklin Morales’ struggles in Saturday’s loss to the Indians. Denver Post suggests Tyler Matzek should replace Morales in the rotation. Bleacher Report makes a case for Troy Tulowitzki to be named NL MVP. Rockies Review believes that everyone is looking forward to the Broncos season and giving up on the Rockies. Rockies Zingers looks into who Colorado will select with the 8th pick of the draft. How long can the Rockies ride Justin Morneau? – Hayden Kane answers. Rox Walkoff expresses the frustration of Rockies fans. Colorado is ready to end its current road trip as soon as possible. Nothing like leaving a guy hanging. The Colorado Rockies are coming off of a three-game stint in Philadelphia. Here is a recap of that series, what we can take from those three games as well as what lies ahead in Cleveland. We’ve all heard that phrase. Now, it’s time to put it to good use. The issue: Why can’t the Rockies reach base on the road? It shouldn’t matter if you draw a walk or get a hit – you get on base both ways. Right now, the Rockies seem to be reaching for that hit instead of being patient at the plate and drawing a walk on the road this season. After torching the Reds in Cincinnati earlier this month, the Rockies were hitting .300 on balls in play. That average has dropped 15 points in just six games away from Coors Field. We can only hope this is just a string of bad luck. Colorado hitters have drawn the fourth-fewest walks this season and only the Diamondbacks have a lower percentage of walks in total plate appearances. When you play in a ballpark that allows a majority of balls in play to drop for hits, that isn’t a bad thing. However, when you are in an unforgiving ballpark, simply making contact just isn’t going to get the job done. Getting runners on base is the goal of every manager going into each game, especially on the road. The Rockies are not doing that as their 6.3 percent walk rate tops only the Milwaukee Brewers in the NL. Now, Troy Tulowitzki is the exception to this vent session. He has shown discipline at the plate with a 17.2 percent walk rate away from Denver. Is it a coincidence that he has a high walk rate during an MVP season? There may be other factors to his outstanding season, but it certainly has helped. What needs to improve is the on-base percentage of Carlos Gonzalez, Wilin Rosario and DJ LeMahieu. Those three need to pick it up and set themselves up for teammates to knock them in. Combined, the trio has 15 walks on the road compared to 30 by Tulowitzki. CarGo’s batting average of .200 of balls in play still isn’t the worst on the team. Rosario checks in with a .167 BABIP. This has lead to an elevated swing rate and more outs from the four and five hitters in the lineup. All these numbers (minus Tulo’s) scream that the Rockies need to take a more balanced approach when batting on the road. This will lead to more wins and an improved road record. Colorado is 12-17 away from home, which ranks 23rd in the majors. If the Rockies don’t improve this key statistic, their road record will remain that poor. This could lead to a missed opportunity at the playoffs and a lot of unhappy fans. Just remember, there’s no crying in baseball. Memorial Day marks a day where we as Americans can express our gratitude for all those serving our country. Though this is just one day set aside for our troops, every day should provoke thought and hope from US citizens nation-wide. As it pertains to baseball, Memorial Day is the first gauge that we as fans can look at our club and see if we are contenders or pretenders. Below are my grades on a few notable Rockies up to this point in the season. Troy Tulowitzki, A-plus. What else is there to say about this guy? Tulo is a prime candidate for NL MVP this season. He leads the league in batting average (.378), on-base percentage (.480), slugging percentage (.720) and is ranked in the top-5 in RBI (36), home runs (14) and hits (62). Tulo committed his first error of the season on Monday, bringing him back down to earth along with the rest of majors. Charlie Blackmon, A. It’s officially “Fear the Beard” season in Denver. Blackmon has embraced the leadoff role for the Rockies and has thrived doing so. He has a batting average of .319, nine home runs and 33 RBI thus far in 2014 – all are career-highs. The 27-year-old is in his first season as a full-time starter. The only reason he is not an A-plus is due to his regression this past month. After a scalding April, Blackmon is hitting .253 and has struckout 13 times thus far in May. Sure, we all saw the regression coming, but how we he respond to a disappointing month? Go show us what you’re made of, Chuck. Justin Morneau, A-minus. Whomever was going to man first base this season was surely going to have high expectations, due to the large shoes Todd Helton left. Morneau has welcomed the challenge and passed with flying colors in the first two months of the season. The Canadian is hitting .315, with nine home runs and 32 RBI. A move to Coors field has treated Morneau well, as he slugging .607 with an OPS of 1.005 in Denver. He needs to show more consistency on the road and fend off pitches. Morneau has struckout 15 times on the road as opposed to only seven at home. Let’s hope he remains healthy and keeps his mind right. If he does, he is in for a terrific season. Jordan Lyles, B-plus. Two months in and it is apparent that the Rockies destroyed the Astros in their offseason trade. That largely is credited to Lyles and his ability to stay in the rotation. Lyles has done an excellent job keeping the ball on the ground, owning a 55-percent ground ball rate. This has led to a .268 BABIP (Batting Average on Balls in Play) – a career-best. What has exposed Lyles is when he leaves the ball up in the zone as he experienced in his last start against the Padres on May 15. Here’s to hoping the 23-year-old keeps hovering around the 3.50 ERA mark all season long. Carlos Gonzalez, B-minus. What has gotten into CarGo? The two-time All-Star has battled a couple of injuries and is only hitting .270 on the season. The power is still there as he has seven home runs and 29 RBI, but there is something that is troubling with CarGo. His plate discipline has been a cause for concern this season. He is swinging at an alarming 39 percent of balls outside the strike zone. He is also swinging at a career-high 53 percent of all pitches. Pitchers are aware of this statistic and will keep pitching around CarGo until he learns to hold his swing. Once he gets back to form, the average will blossom and we will see the old CarGo. Jouhlys Chacin, C-minus. After having a WAR (Wins Above Replacement) of 5.9 last season, it was time for Chacin to solidify himself as one of the top pitchers in the NL. Instead, he has gotten off to a horrendous start this season. Starting the 2014 campaign on the DL with shoulder issues didn’t help. Chacin was rushed back to the Rockies and it has shown how rusty he is. In five starts, Chacin is 0-4 with an ERA of 5.20 and a WHIP of 1.48. What myself and other Rockies fans need to realize is that he just needs time. The 26-year-old is still young and has shown us how well he can pitch throughout his tenure in Denver. Optimism is key to Chacin’s grade as he will improve with more starts under his belt. A.J. Ellis’ ability to celebrate, F. Don’t fret, Rockies fans. I haven’t lost my mind. Yes, Ellis plays for the Dodgers, but he needed to be included in this report card due to unfortunate landing on the DL. Oh, those Dodgers.